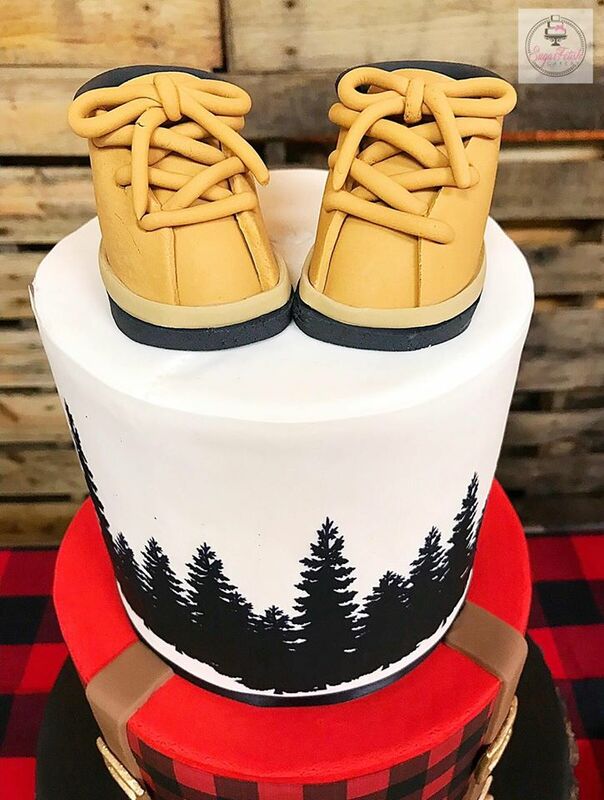 Today I'm sharing these adorable Lumberjack Baby Shower ideas for your dessert table with desserts made by Sugar Fetish Cakery and styled by Simply Charming Designs. 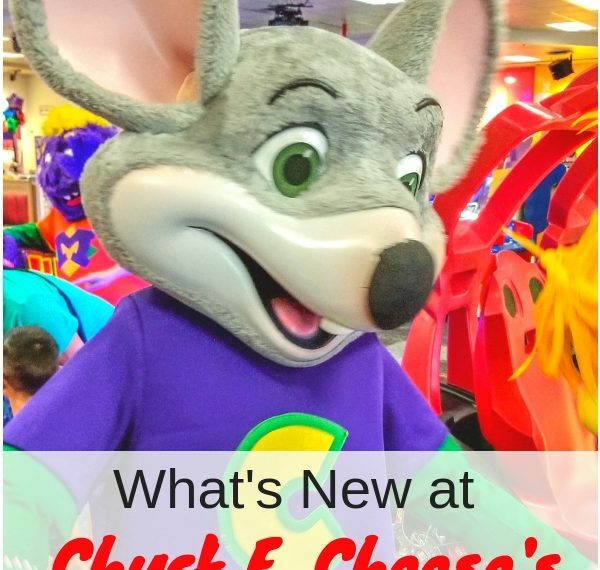 *This post may contain affiliate links for your convenience. If you decide to make a purchase, I will make a commission at no additional cost to you. See my full disclosure policy to learn more. As you may or may not know, I'm having a baby boy shortly, so I've been having too much fun looking at all of the baby boy baby shower themes and ideas out there. 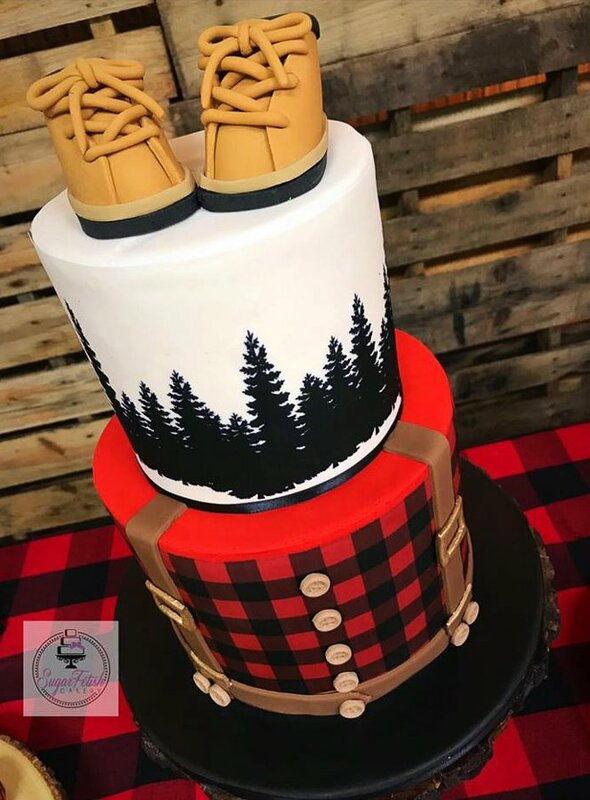 I'm just in love with this buffalo plaid lumberjack baby shower for Baby Rolo submitted by Latisha Johnson, owner of Sugar Fetish Cakery located in New Jersey. 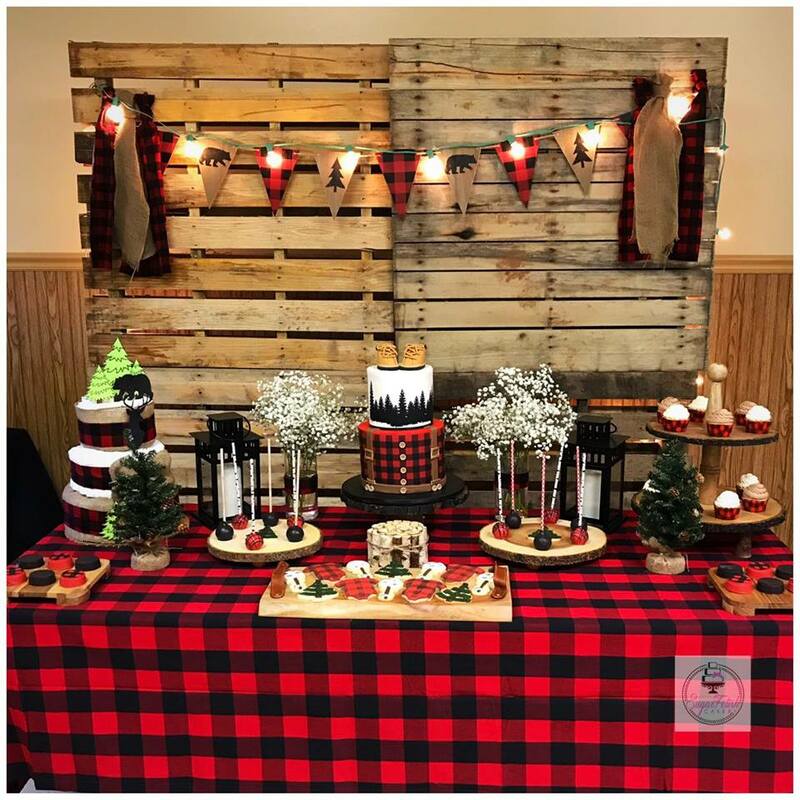 This party is perfect for anyone who loves the outdoors or is just a buffalo plaid fanatic like I am. 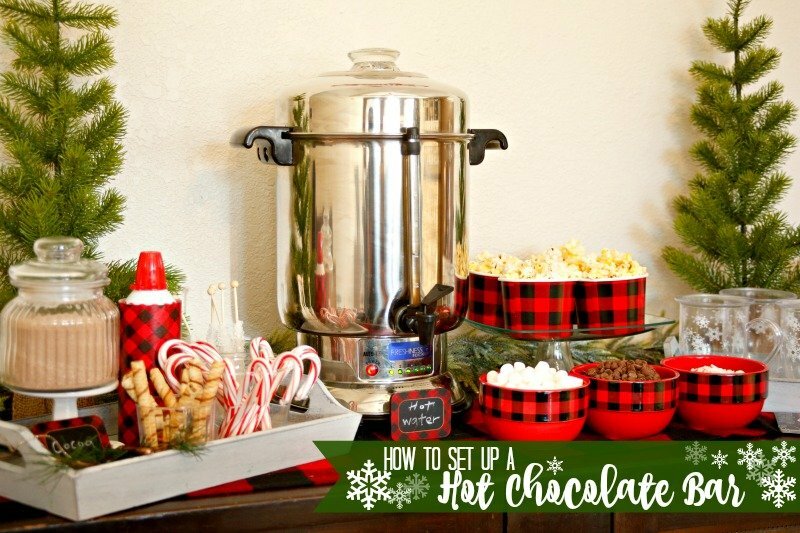 It's full of rustic charm and makes you want to cozy up with a cup of hot chocolate! 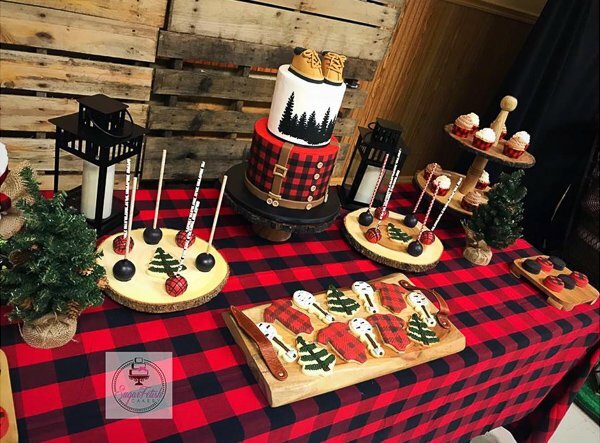 Check out these awesome lumberjack baby shower ideas on this dessert table. I'm a sucker for decorated sugar cookies. I love the texture on these tree cookies and those baby rattles are so fun. I've been wanting to try out a new stencil to make buffalo check cookies like these ones too. 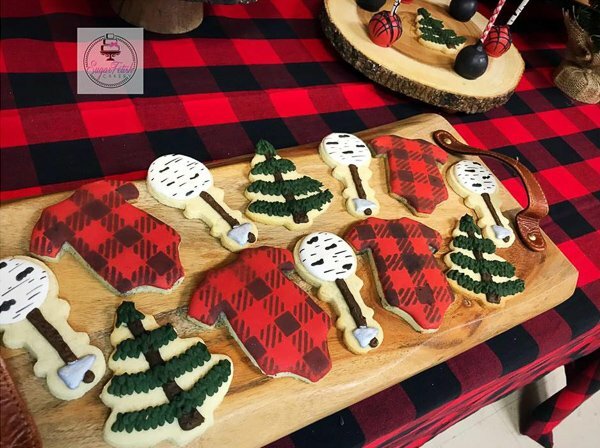 I actually have these buffalo plaid cupcake wrappers, and they can make any delicious cupcake turn into a sweet treat for a lumberjack baby shower. You can purchase buffalo plaid cupcake wrappers here. Also, isn't this wooden stand super fitting? 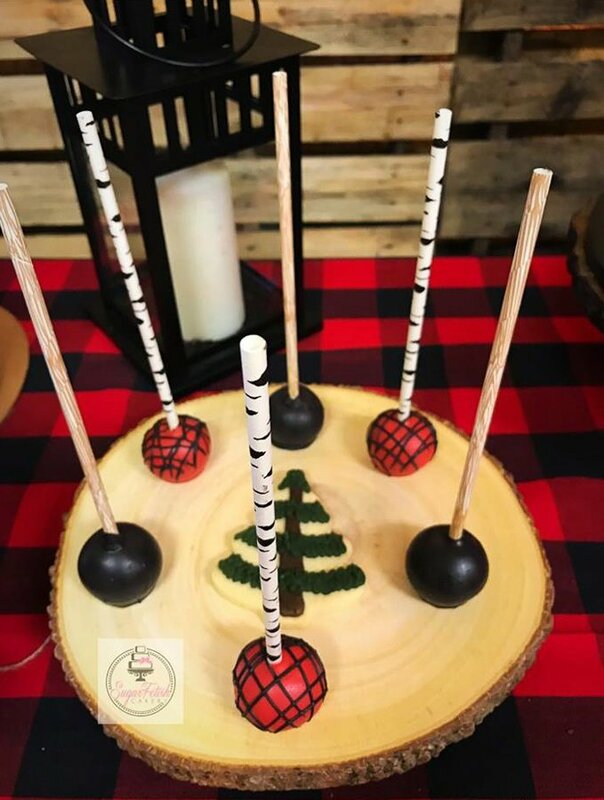 Cake pops are one of my favorite desserts on a dessert buffet. 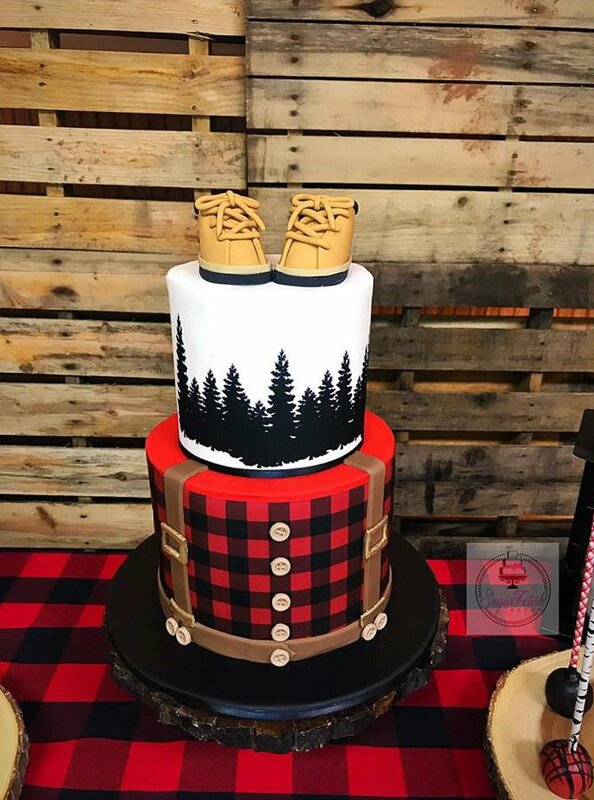 This cake is just the cutest! The details are amazing and I love the clean design. 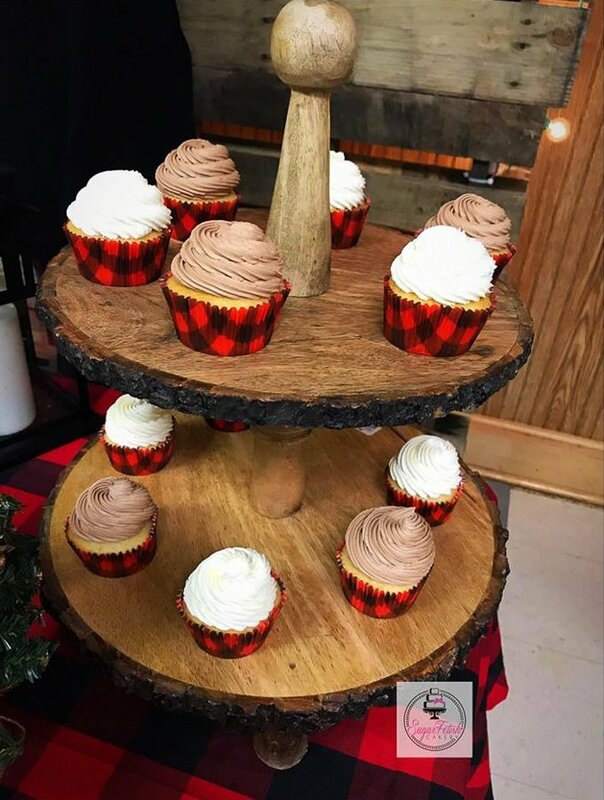 So all of the desserts are absolutely perfect for lumberjack baby shower ideas but so is how Simply Charming Designs styled the party. 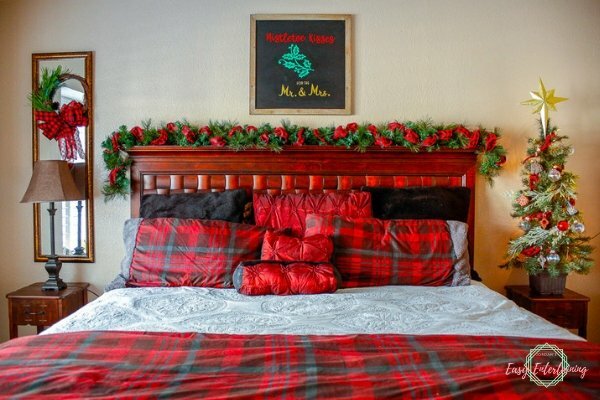 This pallet backdrop with burlap and buffalo plaid banner is just the right touch. I also adore the mini trees, lanterns, and the diaper cake to complete the look. 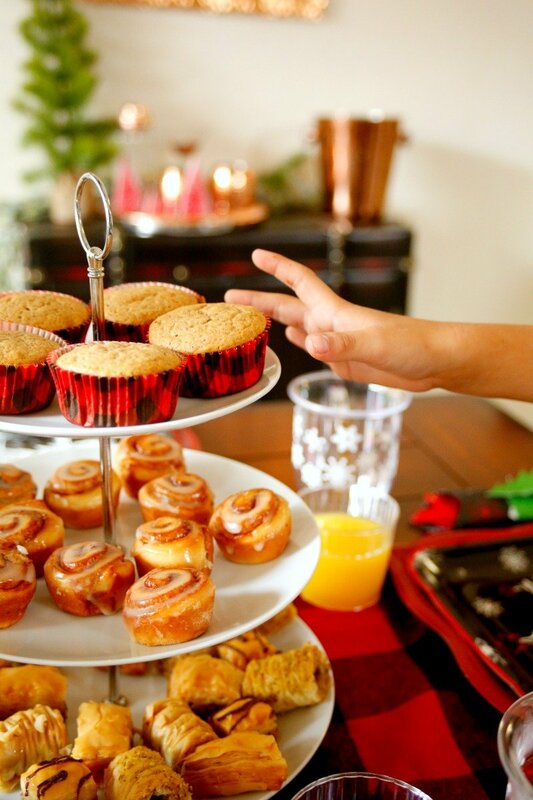 Do you have a party you'd like to be featured on Jordan's Easy Entertaining? Shoot me an email with the subject line "party feature" to hello@jordanseasyentertaining.com with a few photos and a brief description of the party. I share content like this on a regular basis and invite you to join my newsletter. 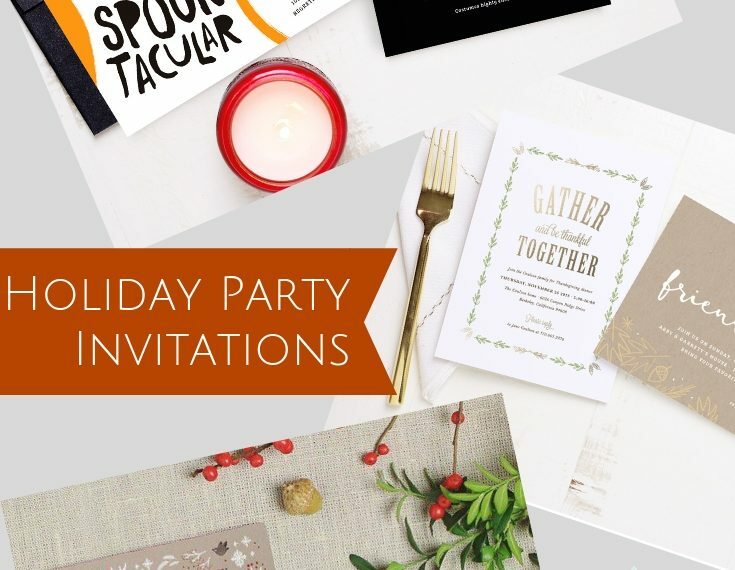 You'll stay up to date with the latest easy entertaining tips, and I also sent out freebies to my subscribers. Sign up below! p.s. 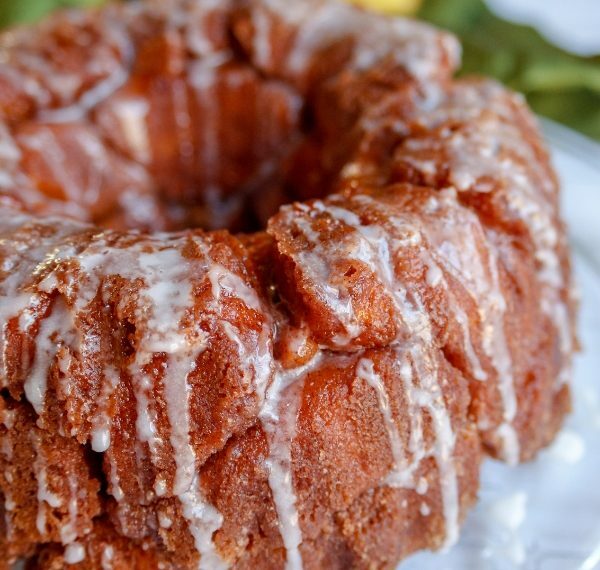 Make sure to follow Sugar Fetish Cakery for more inspiration on Instagram and Facebook too!